You’ve found the perfect location and you’re working with a reputable home construction company. You’re excited about your new home and can’t wait for it to be built and move in. This isn’t just a starter house, this will be your dream house and you plan on growing old here. But first, the house needs to be built. Whether you’re a local in Eureka Springs or Bella Vista home buyer, there are definite steps to the home building process. First, prep the site and pour the foundation. Everything starts at the ground level, so the ground must be level. Extra care is taken in this step to ensure that the house will sit on a solid foundation. Once this step is done and inspected, it’s on to the next phase. Framing comes next. The skeletal system of the house is the next to go up. Two-by-fours, plywood, and house wrapping are erected, leaving spaces for doors and windows. Electrical, HVAC, and plumbing. Once the framing is in place, it’s time to run the HVAC ductwork, run electrical to each room and set up the plumbing for the bathrooms and kitchen. Usually, HVAC and plumbing are added before the electrical since moving wires around ducts are easier than moving ducts and pipes around wires. We specialize in energy efficient homes, read more about that here. Insulation and drywall come next. 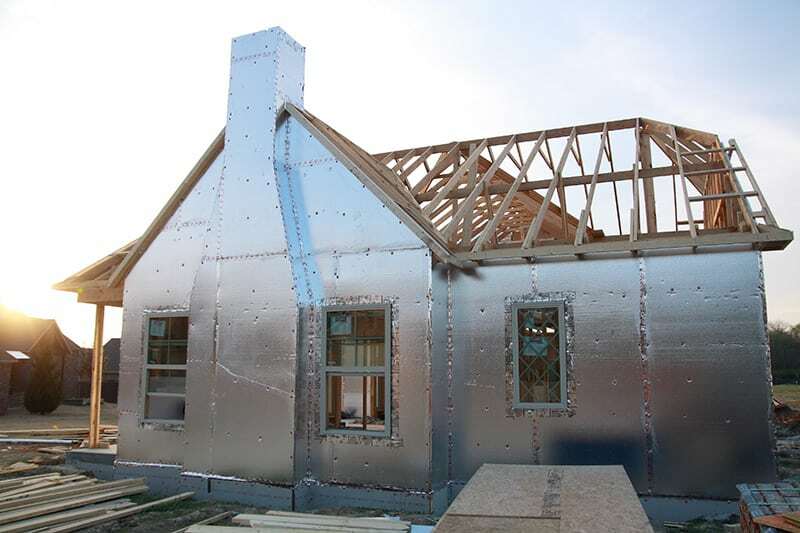 Installing quality insulation not only keeps the home a comfortable temperature inside but saves on heating and cooling costs. Once the insulation is in, the interior drywall is hung and taped. Hard Flooring, countertops and lighting. Once interior walls are finished it’s time for floors, countertops, and lighting. This is where personal tastes and preferences will really shine. Lovely wood or tile flooring with complementing countertops and light fixtures will bring out the personality of the home. Finishing touches and landscaping. The walls are up, lighting, counters, flooring are all in place and it’s time for the finishing touches. Last minute touch-up painting, shower door installations, flooring finishes and adding some attractive greenery are the perfecting touches on your new home. Once everything is finished, the final inspection will take place. This is the time when any issues with the house will be addressed and fixed. Once that is done, it’s all yours! Cobblestone Homes in NWA specializes in building quality homes from the ground up, your dream can be a reality with us.